It’s Nostalgia time! Thanks to sis Rose for creating this nostalgic meme. Anyhow, here’s my entry for this week. 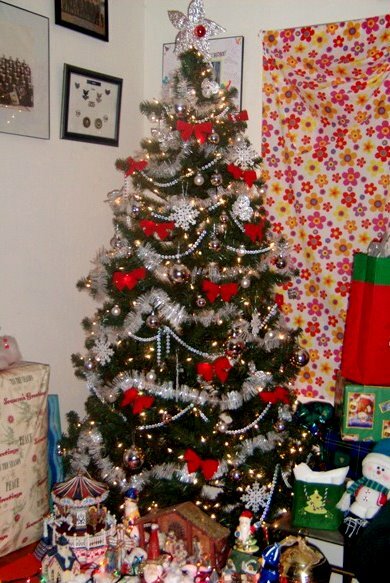 Sharing some photos of our Christmas tree from year 2007-2009. Pardon me if I can't find the 2005 & 2006 photos on my photo folder. Anyhow, does your tree have a color theme? I used to decorate our tree with a variety of colors but I decided to not do it anymore. Our 2009 silver & gold Christmas tree....this year, my Christmas tree color theme is silver and blue...I'm still working on it though. I started setting up our tree this morning. I hope I am able to get it done tomorrow. Wow.. kanindot ana day oi.. lain lain man jud motiff every year.. nice kaayo! wow, amung xmas tree kay way klaro kay daghan ug designer.. hahaha.. nindot Dhemz... agi ko..
Wow naman, pati pala sa pagpili at pag decorate nang Christmas tree ay lumalabas ang pagiging artistic mo. Ang taas nang mga Christmas tree nyo. Ako hindi muna naglalagay nang Christmas tree at Christmas decors mula nung pumunta si misis sa States. Pagbabalik na lang niya. Thanks for the post. God bless you all always. I love the white too mami dhemz! wa koy entry ron kay late na...gabii na...gikapoy ko sa akong lakaw waaaaaaaaa. anyway, hangtud ron wa pa ko kapatindog sa kong christmas tree kay ingon Jason wa pod daw muhipos kung mulagra mi, di daw sya kabalo ahahahaha. Love the white tree sis hehehe, la mo ba gusto rin maglagay ng garland and bows but hubby said "too much" wahhh. Sensya na for my late visit at ako'y busing busy sa school functions wahhhh. i wonder how grand can be ur tree this year? Sarap namang tingnan ng mga Christmas trees na to. Heartwarming. I love your white themed x-mas tree,Mommy Dhemz.Hinde pa naka-up ang tree namin,miedyo tinatamad pa akong magkabit lol!